2,773,500 American Silver Eagle Bullion Coins were sold during the final weeks in 2009, according to the latest United States Mint sales data. Last month ranked as the second best December ever for the silver coin series that was introduced in 1986. 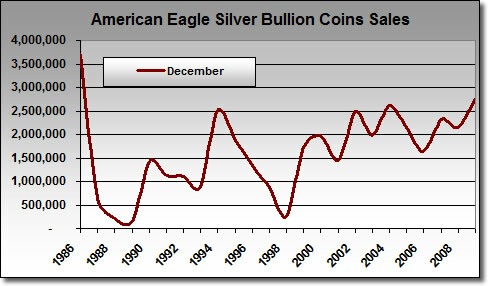 It was the fourth best month in 2009 — a year that saw a record-breaking 28,766,500 eagles fly out of US Mint inventories. December and yearly numbers would have been more spectacular had the coins not been suspended and rationed throughout 2009 due to unprecedented demand. The coins came off their most recent suspension on Dec. 7, 2009 after sales were silent for nearly two weeks. Investors and collectors alike have been purchasing the 2009 coins in droves. 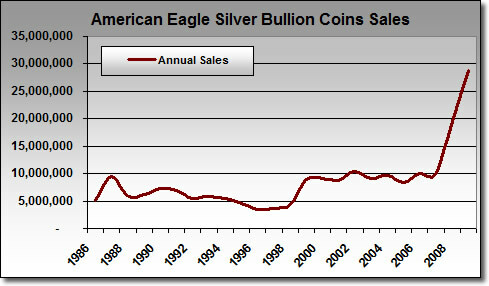 By October, the Silver Eagles hit an all-time record when nearly 21 million were sold for the year. That total surpassed the prior 2008 record of 19.58 million. The fierce demand resulted in a shortage of silver coin blanks throughout 2009, which precipitated the collector proof and uncirculated version cancellations — the first time that had happened since 1986. As of this writing, the US Mint is still selling 2009-dated bullion eagles, which is atypical. Newly dated coins are generally available to the public by the first week of a new year. 2010 bullion eagles go on sale Jan. 19, according to a Mint memo provided to its authorized dealers on Dec. 22. The US Mint sells bullion coins for a small amount over the current spot price of the precious metal within them, but only to authorized purchasers. The authorized purchasers in turn resell the coins to coin dealers, precious metal providers and/or directly to the public.